Keynote: How to work with master slides? Information: Master slides are responsible for the look of your presentation. Master slides are useful for quick editing of the basic elements that are repeated throughout your presentation. For example, logo, font, or the location of the basic links to social networks, etc. 1. 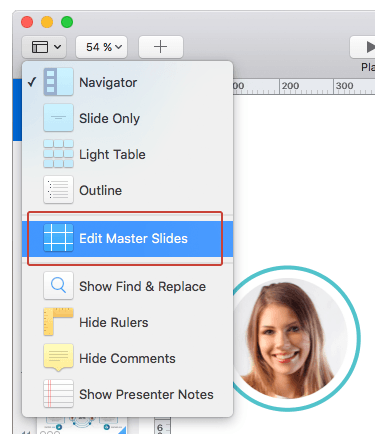 Open the master slides you need to edit. In the top menu select “View” > “Edit Master Slides”. 2. All the changes made to the master slides will affect the appearance of the presentation. 3. 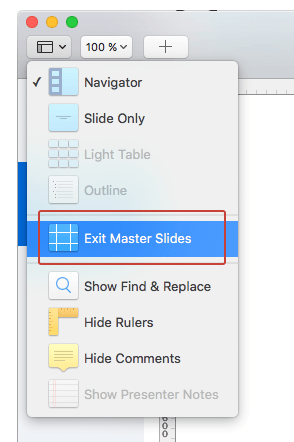 When the editing of master slides is finished click “Done” button in the bottom of the working area or in the top menu select “View” > “Exit Master Slides”.